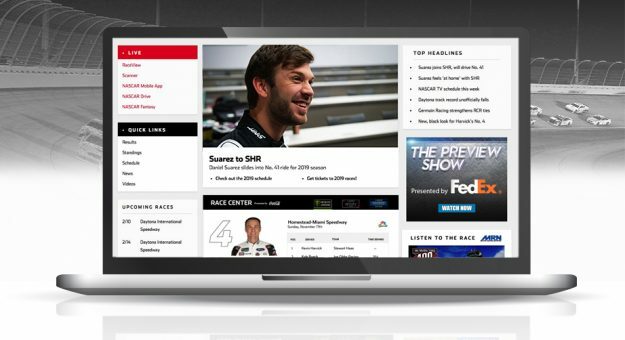 Whether you’re following a race, planning a trip to the track or spending a few minutes catching up on your favorite sport, NASCAR.com’s redesigned homepage will make it easier to find what you’re looking for. The Live Event Module (highlighted in red) will quickly take you to your favorite race-day products such as RaceView, Scanner, NASCAR Drive, NASCAR Fantasy Live and more. Quick Links will feature more of the essentials you love with links to results, standings, the schedule, the latest news and videos. A new top headlines area will make it easy to find the latest news and features that readers like you are gravitating toward. And you will be able to stream the race day broadcast on MRN straight from the homepage. The new NASCAR.com homepage is live, so send us your feedback at sitefeedback@nascar.com.